A house-attached greenhouse with translucent corrugated fiberglass. Photos by Dan Potts. I have designed, built and managed a variety of different greenhouses over the past 40 years. All of them have been primarily intended for starting hundreds of transplants for many varieties of vegetables for our garden and many others. My wife and I have never actually used a greenhouse for growing food. Obviously, some folk do, although that would be more aligned to farming than to the home gardening we do. We have friends who grow vegetables early in the spring and also in the fall and winter to “extend” their food growing seasons, and they usually produce more than they can use. Like many other more agriculturally-oriented gardeners, they have chosen to use “hoop” greenhouses that can be purchased locally and are relatively easy to assemble. Most greenhouses, including hoop houses, often require the daily hassle of managing the temperature inside because they typically overheat and usually require fans or daily work to ventilate them. The first greenhouse I designed and built was essentially a creative experiment in solar applications. It was very small, could be rolled around on casters, and had hinged reflectors intended to increase solar radiation, lots of insulation, and a relatively large amount of thermal mass in the form of water-filled milk jugs intended to moderate the temperature inside. I learned a lot in that first attempt, but the design required too much work opening and closing it every day relative to the nighttime temperatures and weather conditions. Subsequent models have been built with an eye to reducing work and excess heat. 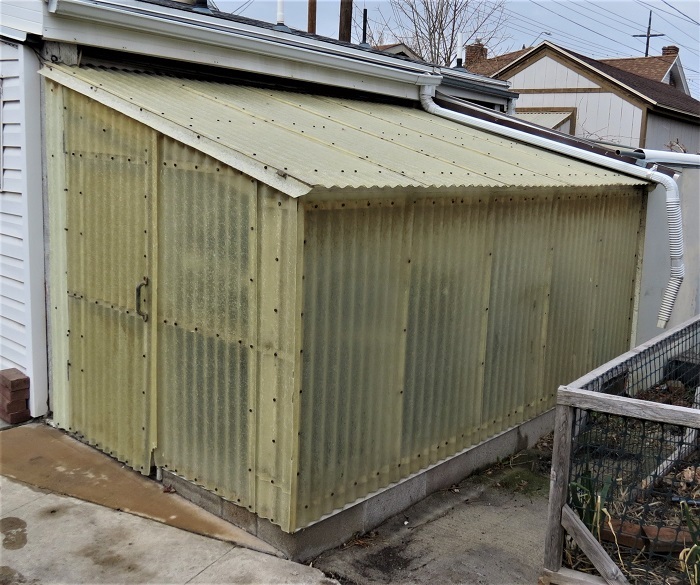 Our current greenhouse was attached to our house more than 30 years ago, and was built partially underground to manage the temperature inside. It faces due east to capture the warm morning sun when our plants need heat the most. It is constructed of simple painted framing covered with inexpensive, widely available translucent corrugated fiberglass glazing which does a great job of diffusing the light. This functional solar collector generates so much heat during the fall, winter, and spring months that we actually use it to heat our home via a small automatic fan. We do heat the greenhouse a little during the coldest nights with our furnace. Otherwise, it is unheated. It has heat mats for germinating seedlings, adjustable-height florescent lights to get them growing, and a work area for planting and re-potting. The lights are needed to extend the short winter daylight to an optimal 19 hours, and a timer turns them on later in the night to provide a little extra heat. Like all earlier models, it utilizes a lot of thermal mass in the form of open 55-gallon drums and other water-filled containers to absorb the sun’s heat and re-radiate it later on. Plus, to increase that mass, it has a smooth concrete floor with a drain in the center. 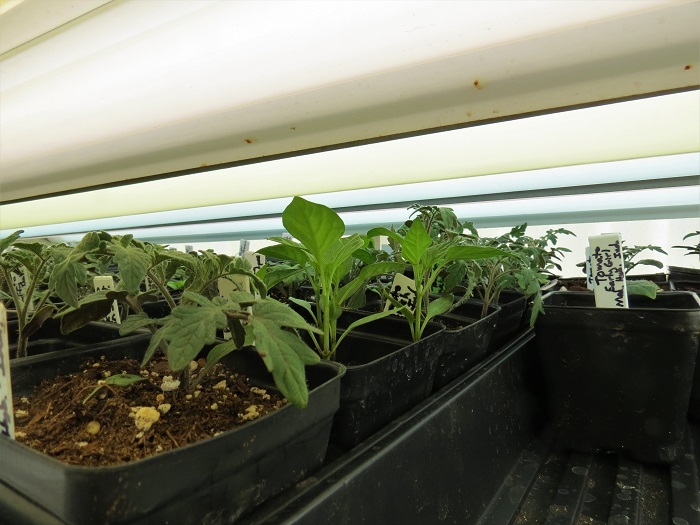 Diseases and insects can become a problem in greenhouses. Damping off, a fungal disease, can become established, affecting younger plants during colder times, but can be controlled by either maintaining higher temperatures or watering with a fungicide. Mosquitoes can start reproducing in any open water. Covering water containers or stocking a few inexpensive goldfish will solve that problem. We love our greenhouse. It helps to heat our house and pumps out all of the veggie transplants we could possibly use, and then some. And working in the greenhouse on a cold winter day can help cure me of cabin fever. There is plenty of literature out there to help you design your own greenhouse. It can be relatively easy to build and maintain, or you could simply buy and install a hoop house to help extend the growing season.